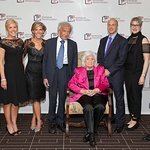 The Multiple Myeloma Research Foundation (MMRF) was established in 1998 as a 501©(3) non-profit organization by identical twin sisters Kathy Giusti and Karen Andrews soon after Kathy’s diagnosis of multiple myeloma. Kathy’s need was urgent. She was looking for a cure. Google trends for "Multiple Myeloma Research Foundation"
We don't have any videos related to Multiple Myeloma Research Foundation.